I would like to emphasize on the need to look at Kettler Stroker Rowing Machine, not because I want you to, but because it has been around for some time and it’s being manufactured by a reputable company that has made its mark in the fitness industry. 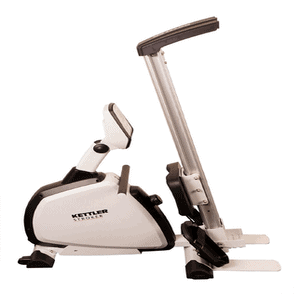 Kettler Stroker Rowing Machine is being manufactured by a German company that was established in 1949. They have productions in well over 60 countries including the U.S.A where they have been producing and selling their stuff under the name Kettler USA. It is noteworthy to mention the numerous international awards they have bagged for themselves over the years, as a result, good product. They are into the production of other fitness equipment such as elliptical machines, treadmills, bikes, and cross trainers. Aside from its pedigree, the Kettler Stroker Rowing Machine has several notable features ranging from a well-padded seat for comfort to bio-mechanical foot plates that provide full longitudinal rowing motion. The LCD monitor displays 6 functions at the same time, namely; time, oar strokes, current cadence, cumulative distance over a training session, kilojoules and heart rate. It comes with a chest strap sensor that transmits the heart rate data wirelessly to the computer. You can manually adjust the magnetic brake system resistance with indexed settings from 1 to 8 so that you can challenge yourself with the available options. Let’s have an overview of the features and pros of the Kettler Stroker Rowing Machine. • It has accessory attachments that provide 10 additional exercises. • A manually adjustable magnetic brake system resistance with indexed settings from 1 to 8 allowing you to challenge yourself during a workout. • Features an LCD that displays 6 functions simultaneously which includes time, the oar stroke, current cadence, and cumulative distance over a training session, kilojoules and heart rate. • A thick padded seat that ensures comfort with top grade rollers to provide outstanding seamless performance. • It has biomechanical footplates that offer a natural pivoting action providing a full longitudinal rowing motion. • It comes with a Polar T34 chest strap heart rate monitor. • It has a space saving design; which means, it is a compact machine that can be stored even in a small space. • It can accommodate almost any body size but supports 286 pounds maximum user weight capacity. Taller people of 5ft 11’’ and above have attested that the biomechanical footplates really provide a natural pivoting action indeed. Which means taller individuals can fully extend their legs while working out without any hitches or slowing down during motion. • Several ranges or levels of fitness programs have been made possible for users due to the adjustable magnetic resistance system which has made it possible for users to reach their goals as well. With this system, users can easily decrease or increase the intensity of their workout simply by manually adjusting the system. • Since your workout data will be displayed on the LCD monitor such as the oar strokes, calories, time, cumulative distance per training session, cadence (i.e stroke rowed per minute) and heart rate, this will motivate the user to workout with intensity. • The Kettler Stroker Rowing Machine is seen as ‘’multi-trainer’’ because of its ability to provide cardio and strength training at the same time and so many think it worth the money. Users reckon that the machine will help to stop gym trips and membership fees as well. The drawback is certainly not serious because there was an isolated complaint by a user about the seat not being comfortable enough that he had to stuff things to make it comfortable. Really, I didn’t find any serious defect that could warrant not buying this machine. From the look of things and the testimonies of people that have used this machine, it is a machine that is worth buying and worth every dime you are paying for it. I skipped mentioning how sturdy and durable the machine is. All the rated reviews by actual users were either 5 or 4 stars. The majority really favored this equipment and I must say it is outstanding. If you are looking for a rowing machine for your home gym, then go to Amazon right now to grab yours, or you may have a look at Concept2 Model D Indoor Rowing Machine PM3, or better still check our hand-picked rowing machine reviews.